Prompted by the final space shuttle launch of Atlantis, I thought I would have another look at two line elements (TLEs). These are coded lines of data that describe the orbital dynamics of a space vehicle. 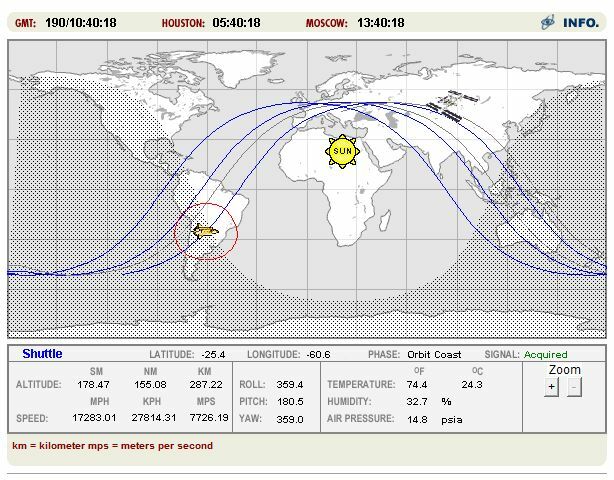 The last time I looked at this was when I was working on a GPS tracking project and we wanted to predict the satellite constellation at a particular time of day, but TLEs can also be downloaded for the shuttle and International Space Station. The next step was to download his C# library and write the code to load the shuttle TLE and convert the position to a location on the Earth. One point worth mentioning here is that the library calculates lat/lons in WGS72 rather than WGS84. The spheroids are slightly different, so there will be some small accuray issues, but it’s close enough for our purposes. TimeSpan ts = VehicleOrbit.TPlusEpoch(dt); //how old is our TLE? These values are very close to the figures on NASA’s J-Track image reproduced earlier, so we’re close to the official coordinates. When repeating this, it’s important to fix the time in the code to the same time as displayed on the J-Track applet and not just use “DateTime.UtcNow” as is commented out in the code. This is one source of inaccuracy as we’re assuming the position was calculated at zero milliseconds, which might not be the case.